Pyongyang movie starring Steve Carell in North Korea scrapped. 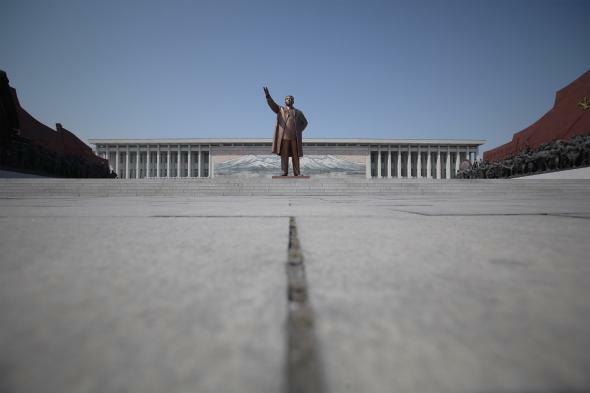 The Immortal Statue of Kim Il Sung monument in Pyongyang, North Korea. All of sudden making movies set in North Korea doesn’t have quite the same allure for Hollywood studios. Sony Pictures is obviously already on the financial hook for The Interview, which was in the can and scheduled for a Dec. 25 nationwide release before it was called off on Wednesday. New Regency Pictures, which announced in October its plan to produce a film set in North Korea starring Steve Carell, reportedly took a look a closer look at the North Korea/Hollywood relationship on Wednesday and thought—nah. It’s canned the fledgling project. So much for Hollywood’s leadership with the whole not-letting-the-cyberterrorists-win thing. “A source close to the project confirmed that production company New Regency had stopped development on the untitled film after Twentieth Century Fox pulled distribution plans,” according to Huffington Post. The movie was to going to be based on the graphic novel Pyongyang, and Gore Verbinski had been set to direct the film adaptation, which was scheduled to start shooting in March. Presumably not in North Korea.